The Issue No. XLV, 02/2011 aims at mapping a part of the huge activities held during the European Programme “Europe as a Space of Translation” (EST – grant EACEA, Culture Programme 2007-2013. Applying partners: University of Naples, “l’Orientale”, Paris 8, Vienna; associated Parteners: University of Istanbul, Dresden, Bucarest; Literary Journals such as Semicerchio and Testo a Fronte, and many other cultural institutions). EST is a project thanks to which several universities, cultural institutions, literary magazines, media players, interact both with their own territory and with a wider European area. In different cultural forms and expressions, EST meant to give visibility to the role and work of translators as crucial cultural agents, both in their own countries and abroad, decisive in the process of change in many fields. The first meeting was held 2009 in Naples, coordinating site for the project, on 29th January, with a press conference and the “Living and writing among languages” workshop. The following meeting was in Paris, in an European workshop devoted to Translation and psychoanalysis, in June 2009, and subsequently in Vienna (November of the same year), in a Summer School devoted to the construction and deconstruction of the Mediterranean identity between East and West and on the Island of Procida. The whole EST-project has drawn the attention of the major cultural operators in this field, such as the Frankfurt Book Fair that will host a specific international presentation on 8th October 2010. This project has inaugurated channels of communication and scientific cooperation among European Universities, showing the existence of a Homeland for a fertile and open-minded study of humanities in Europe. Thanks to the EST Projects several cultural and professional institutions (such as theatres, galleries, cultural centres, museums), social agents (cafés, bookshops, book-fairs), educational and research institutions (primary and secondary schools, art and music academies, science academies, universities), professional associations (of writers, translators, authors), international cultural institutions (cultural Institutes of different European Nations) interact both with their own territory and with a wider European area. The present issue is dedicated to the section of the Programme devoted to poetry in translation in Europe and beyond. 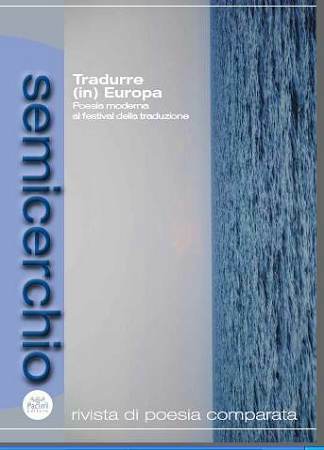 The literary journal “Semicerchio” was one of the most important associated partners in this programme, to which it contributed with a significant amount of ideas and events, and with the publication of two issues of the journal. One of these is Tradurre (in) Europa, Translating (in) Europe (forthcoming is issue L’antico parla oggi, Antiquity speaks today). The use of brackets in the title means the double intention of the Project: to disseminate the value and the art of translation and translators in Europe, and secondly, and most keenly, to “translate Europe” in a space of literary comparison and exchange running on the paths of poetry. It is divided in four sections: Spaces, Contemporary “Divans”, Emerged Lands, Between Linguae and Dialects. Each of them is provided with an introduction fixing the theoretical frame of the translated texts. The first section is dedicated to the “Spaces” of translation. It begins with a theoretical essay of Camilla Miglio, trying to focus a new way of conceiving space in translation, different from “transporting” a text from one side to the other, but close to the idea of a “movement of language” able to “produce spaces” and bring what is unsaid and unwritten in the source text to the textual evidence of the different possible translations. Starting points of this reflections are: 1.The incipit of St. John’s Evangelium, providing a re-interpretation of the lines “en arché en o logos, kai o logos en pros ton theon” in a spatial, and not in a temporal way; 2. Paul Celans investigations of “the interlinear spaces of poetry” (“poetry as translation”), seen as spaces between the branches of a tree; his attention to the “branches, not to the (lost) roots, stays for a progressive, productive conception of translation, projected in a space-to-be-drawn by language. In the following ‘anthology’of this section the translated texts, the authors and the translators show how poetry and language(s) can create new ‘spaces’. So from the German Ingeborg Bachmann’s Songs of an Island translated by Camilla Miglio; Marcel Beyer’s Geography translated by Giusy Borrelli, Antonella Pinto, Luigia Tessitore, Denise Fasano, Liana Di Martino and Gabriella Infante; from the Greek Michalis Pierìs’ Metamorphosis of Cities, translated by Paola Maria Minucci; from the Arab Adonis’ Twelve Lanterns for Granada, translated by Francesca M. Corrao, Mahmud Darwish’ I see my Shadow coming from afar, translated by Simone Sibilio; from American English Emily Dickinson’s Experiment of Green, translated and analysed by Marco Giovenale. The second section, “Contemporary Divans”, introduced by a theoretical foreword by Camilla Miglio, takes its starting point from the Persian concept of “Divan”, that is to say: a place where people have conversation (like our sofas! ), but also a collection of words, or better: of poems, like Petrarca’s ‘Canzoniere’. This forms has become famous in Europe through Johann Wolfgang Goethe, who – rewriting and re-inventing the Persian medieval poet Hafiz – at the beginning of the XIX Century manages successfully a dialogue between East and West over time and space. With this pattern in mind, we collected new “Divans”: a Japanese-Canadian one, translated and introduced by Maria Rosa Piranio, a German-Italian one, translated and introduce by Theresia Prammer and Federico Italiano. The third section, “Emerged Lands” is introduced by Monica Lumachi, who draws a geography of poetry and languages of the so-called “minor languages of Europe” showing that their minority is not at all true. It true for the poetry of the lands once beyond the iron curtain, but also of many important literary productions of Western Europe that are worth to be read more and more, to give evidence to a new poetic cartography. So: Northwards: Morten Sondergaard, translated from the Danish and introduced by Bruno Berni; Fleur Bourgogne, translated from the Netherlander and introduced by Franco Paris; Eastwards: Ana Blandiana and Grete Tartler, translated from the Rumanian and introduced by Luisa Valmarin; Màrton Kalsz, introduced by George Gutu and translated from the German by Monica Lumachi; Mirela Ivanova, translated from the Bulgarian and introduced by Lara Fortunato; Westwards: from the Catalan, Ausias March, introduced and translated by José Maria Micò; “voices from a plural Spain” (poets from Galicia, Basque Region, Catalogna), introduced and translated by Attilio Castellucci; from the Romancio, Ursicin G.G. Derungs, self-translated by Derungs and introduced by Monica Lumachi; Southwards: from the Kurd, in the Kurmanij variety: Şêxmûs Hesen / Cigerzwîn, introduced and translated by Antonella Cassia; from the Afrikaans, Antje Kroog and Ronelda Kamfer, introduced and translated by Francesca TerrenatoThe fourth section, dedicated to the relationships between the so-called major/official languages and dialects, in their huge poetic expressions, is introduced by Roberto Galaverni. His article presents Michele Sovente, a poet who lived and worked in Campi Flegrei, near Naples, who died a few months after his participation to the Neapolitan Festival of Translation. Sovente’s verses are written in such different languages as Latin, Italian and the his local dialect. Indeed, Sovente’s works - from the colletion Cumae, (1998), to Carbones (2002) - refer to the ancient, noble classical tradition as well as to the equally strong Italian tradition of dialect poetry. According to Galaverni, the language mix in Sovente conveys a sense of poetry and of the poet's role as a combination of, on the one hand, a poeta vate, prophet, male-Sibyl and, on the other, a craftsman, bricoleur, ironical and cultured writer. Drawing on Giacomo Leopardi and Walter Benjamin, Galaverni presents Sovente's verses as made of and based on the ruins of history and the past, as well as those bright moments that shine through life then and now. Three lyrics follow, one of which - unpublished - was given by Sovente to Camilla Miglio as a ‘gift’ for the Neapolitan Festival. The article presents Michele Sovente, a poet who lived and worked in Campi Flegrei, near Naples, who died a few months after his participation to the Neapolitan Festival of Translation. Sovente’s verses are written in such different languages as Latin, Italian and the his local dialect. Indeed, Sovente’s works - from the colletion Cumae, (1998), to Carbones (2002) - refer to the ancient, noble classical tradition as well as to the equally strong Italian tradition of dialect poetry. According to Galaverni, the language mix in Sovente conveys a sense of poetry and of the poet's role as a combination of, on the one hand, a poeta vate, prophet, male-Sibyl and, on the other, a craftsman, bricoleur, ironical and cultured writer. Drawing on Giacomo Leopardi and Walter Benjamin, Galaverni presents Sovente's verses as made of and based on the ruins of history and the past, as well as those bright moments that shine through life then and now.